Vicia faba, also known as the broad bean, fava bean, faba bean, field bean, bell bean, English bean, horse bean, Windsor bean, pigeon bean and tic(k) bean, is a species of flowering plant in the vetch and pea family Fabaceae. The origin of this legume is obscure, but it had been cultivated in the Middle East for 8,000 years before it spread to Western Europe. Fava beans have been found in the earliest human settlements. They probably originated in the Near East during the Neolithic Age and by the Bronze Age had spread to Northern Italy. They have been found in lakeside settlements in Switzerland and in Britain at Glastonbury. Remains are reported to have been found in Egyptian tombs. In Egypt, the beans were considered commoner food and were shunned by the upper classes. Fava beans were cultivated by the Egyptians, Greeks and Romans. In ancient Rome, they were used in funeral rites. Like all priests of the Orphic and Eleusinian mysteries who were forbidden from ever touching, mentioning, or looking at Fava beans, Pythagoras forbade his followers from doing the same and some claimed that it was due to his belief that fava beans contained the souls of the dead. 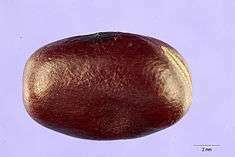 This once forbidden bean is also related to favism, a genetic deficiency most commonly affecting people of Mediterranean origins. Initiates of the Eleusinian mysteries where studies were done on a ritual that transmogrified participants were said to have a death-like experience after ingesting the kykeon and would then pass by the home of Kyamites, the Greek demigod of Fava beans. In parts of the English-speaking world, the name "broad bean" is used for the large-seeded cultivars grown for human food, while "horse bean" and "field bean" refer to cultivars with smaller, harder seeds (more like the wild species) used for animal feed, though their stronger flavour is preferred in some human food recipes, such as falafel. The term "fava bean" (from the Italian fava, meaning "broad bean") is used in other English-speaking countries such as the United States. "Broad bean" is the most common name in the United Kingdom, Australia and New Zealand. Vicia faba is a stiffly erect plant 0.5–1.8 m tall, with stout stems of a square cross-section. The leaves are 10–25 cm long, pinnate with 2–7 leaflets, and of a distinct glaucous grey-green color. Unlike most other vetches, the leaves do not have tendrils for climbing over other vegetation. The flowers are 1–2.5 cm long, with five petals, the standard petal white, the wing petals white with a black spot (true black, not deep purple or blue as is the case in many "black" colorings,) and the keel petals are white. Crimson-flowered broad beans also exist, which were recently saved from extinction. The flowers have a strong and sweet scent which is attractive to bees and other pollinators, particularly bumble bees. The fruit is a broad, leathery pod, green maturing to blackish-brown, with a densely downy surface; in the wild species, the pods are 5–10 cm long and 1 cm diameter, but many modern cultivars developed for food use have pods 15–25 cm long and 2–3 cm thick. Each pod contains 3–8 seeds, round to oval and 5–10 mm diameter in the wild plant, usually flattened and up to 20–25 mm long, 15 mm broad and 5–10 mm thick in food cultivars. Vicia faba has a diploid (2n) chromosome number of 12 (six homologous pairs). Five pairs are acrocentric chromosomes and one pair is metacentric. Various agricultural books state that Vicia faba is "not a true bean"; the sense of the word "bean" that they implicitly reference is the narrow one restricted solely to the genus Phaseolus. However, the definitions of "bean" in most general dictionaries include several senses, narrow and wider, with broad beans among them. The word "bean" and its Germanic cognates have existed in common use in West Germanic languages since before the 12th century, which was long before the New World genus Phaseolus was known in Europe, so it is not surprising that the prescription on limiting the use of the word, which tries to replace the word's older senses with a newer one, has never been consistently followed in general usage. Broad beans have a long tradition of cultivation in Old World agriculture, being among the most ancient plants in cultivation and also among the easiest to grow. Along with lentils, peas, and chickpeas, they are believed to have become part of the eastern Mediterranean diet around 6000 BC or earlier. They are still often grown as a cover crop to prevent erosion, because they can overwinter and because as a legume, they fix nitrogen in the soil. The broad bean has high plant hardiness; it can withstand harsh and cold climates. Cold tolerance among fava bean cultivars varies, but most varieties winter-kill at temperatures below -−9 °C (16 °F) and even the most winter-hardy winter-kill at temperatures below −12 °C (10 °F). Fava bean grows during cool weather when other vetches and clovers are relatively dormant, but does not tolerate heat well. Unlike most legumes, the broad bean can be grown in soils with high salinity, and a wide range of pH values (4.5–8.3) as well as in clay soil. However, it does prefer to grow in rich loams. Broad beans will grow best at soil temperatures between 15.5 and 18.3 °C (59.9 and 64.9 °F) and will not grow well at temperature below 4.4 °C (39.9 °F) or above 23.8 °C (74.8 °F). Broad bean is particularly susceptible to high temperatures during the summer which makes the plants unproductive. Broad beans will grow best in a fertile, well-draining soil with a pH between 6.0 and 6.75 located in full sunlight. Broad beans should be direct seeded in the garden in Spring as soon as the soil is workable and temperature is above 4.4 °C (39.9 °F) with the optimum temperature for germination being between 10 and 21 °C (50 and 70 °F). A second planting can be made in early autumn in areas with moderate winters. Seeds should be planted 2.5–5.0 (1–2 in) deep allowing 7.5 to 15 cm (3.0 to 5.9 in) in between plants and approximately 0.6 m (2 ft) between rows. Tolerance to heat, drought and flood is very low. An excellent nitrogen producer, follow on crops can be given half the usual rate of nitrogen. Grows well in nitrogen poor soils. To achieve the highest nitrogen fixation, the bacterium Rhizobium leguminosarum biovar viceae, must be present. Inoculation of the planting seeds is highly recommended, especially in areas where legumes have not been grown. Inoculation with Rhizobium and arbuscular mycorrhizal fungi biofertilizer is more effective for promoting growth of faba bean grown in alkaline soils than the individual treatment, reflecting the existence of synergistic relationships among the inoculants. 'Bunyard’s Exhibition': Introduced before 1835. A longpod variety producing a large harvest of delicious flavoured white seeded beans with up to 9 beans per pod. 'Imperial Green Longpod': An excellent variety, plants produce a very heavy harvest with pods growing up to 15 inches in length containing 9 green beans. The taste is superb and the beans freeze well. Awarded the RHS Award Of Garden Merit (AGM). 'Optica': Lower growing plant, awarded the RHS Award Of Garden Merit (AGM). It is a very heavy cropper with short pods containing 5 white beans. If the pods are picked young they can be eaten whole. 'Red Epicure': Pods contain up to 5 crimson red beans. Dates from 1894. ‘Witkiem Manita’: An early-maturing cultivar with heavy yields and a tolerance to cold weather. Broad bean plants are highly susceptible to early summer infestations of the black bean aphid, Aphis fabae, and a wide variety of Aphis spp., Acyrthosiphon pisum, and Myzus persicae, (Pea aphid, Bean aphid, Cowpea aphid, Melon aphid, Peach aphid). Aphids occur as small, soft-bodied insects on the underside of leaves and/or stems of the plant. They are usually green or yellow in color, but may be pink, brown, red, or black depending on species and host plant. If aphid infestation is heavy, it may cause yellow and/or distorted leaves, necrotic spots on leaves, and/or stunted shoots. 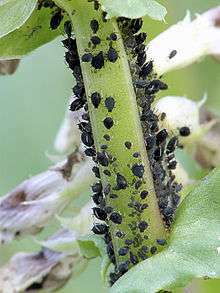 Aphids secrete a sticky, sugary substance called honeydew which encourages the growth of sooty mold on the plant. Severe infestations can significantly reduce yields, and can also cause discolouration of pods and reduction in their saleable values. Mexican bean beetle, Epilachna varivestis, irregular patches of feeding damage on underside of leaves which causes the top surface of the leaf to dry out, giving the leaves a lacy appearance; insect will also damage flowers and small pods; pods may be damaged so badly that they drop from the plant; adult insect is an orange-brown beetle with black spots; larvae are fat-bodied grubs which taper at the end and are in rows of conspicuous spines. Beetles can decimate bean crops. Spider mites, actually Arachnids, (Two-spotted spider mite), Tetranychus urticae Leaves stippled with yellow; leaves may appear bronzed; webbing covering leaves; mites may be visible as tiny moving dots on the webs or underside of leaves, best viewed using a hand lens; usually not spotted until there are visible symptoms on the plant; leaves turn yellow and may drop from plant. Spraying plants with a strong jet of water can help reduce buildup of spider mite populations; if mites become problematic apply insecticidal soap and/or neem oil to plants; certain chemical insecticides may actually increase mite populations by killing off natural enemies (which are also mites) and promoting mite reproduction. Leafminers, Lyriomyza spp., thin, white, winding trails on leaves; heavy mining can result in white blotches on leaves and leaves dropping from the plant prematurely; early infestation can cause yield to be reduced; adult leafminer is a small black and yellow fly which lays its eggs in the leaf; larvae hatch and feed on leaf interior. Thrips (Western flower thrips, Onion thrips), Frankliniella occidentalis, Thrips tabaci, if population is high leaves may be distorted; leaves are covered in coarse stippling and may appear silvery; leaves speckled with black feces; insect is small (1.5 mm) and slender and best viewed using a hand lens; adult thrips are pale yellow to light brown and the nymphs are smaller and lighter in color. Faba bean rust, also called Broad bean rust, is one of the most common fungal pathogens commonly affecting broad bean leaves, causing small, dusty, dark brown spots with yellow halos on the leaves and stems, which may merge to form an orange lawn on both leaf surfaces. Emergence of the disease is favored by warm, humid conditions; fungus overwinters on crop debris on the ground. Chocolate spot fungus, is also a common fungal pathogen. The fungus causes dark, chocolate-coloured spots on all parts of the plant. Chocolate spot is caused by two Botrytis fungi. Botrytis fabae is the most common cause and only affects broad beans. Botrytis cinerea can cause very similar symptoms, and this fungus also causes grey mould on a very wide range of plants, which can have a severe impact on yield. Symptoms of disease can be aggressive or non-aggressive; symptoms on non-aggressive chocolate spot are small red-brown lesions on leaves of the plant which may also be present on stems and pods; under high humidity the disease moves to the aggressive stage and lesions coalesce and become covered in fluffy mycelium; large patches of tissue can become necrotic and die. Long periods of high humidity promote the switch from the non-aggressive phase to the aggressive phase; the aggressive phase of the disease favors low levels of potassium and phosphorus in the soil and overcrowded plants that limit air circulation. Powdery mildew, Erysiphe pisi, fungal infection with yellow spots on upper surface of leaves; powdery gray-white areas which coalesce to cover entire plant; if plant is heavily infected it may appear light blue or gray in color. Fusarium root rot, Fusarium solani, fungal, stunted plant growth; yellowing, necrotic basal leaves; brown-red or black streaks on roots that coalesce as they mature; lesions may spread above the soil line. Damage caused by the emergence of the disease is worsened by warm, compacted soils, limited soil moisture and poor soil fertility. Downy mildew, Peronospora viciae, fungal, yellow-brown blotches on upper surface of leaves; angular patches of fluffy white-gray fungus on lower side of leaves; plant growth may be stunted or distorted and whole plant may die before flowering; fungus overwinters in soil and on crop debris; fungus can survive in soil for 10–15 years. Leaf blight, Xanthomonas campestris, syn. Xanthomonas axonopodis, a bacterium which causes water-soaked spots on leaves that enlarge and become necrotic; spots may be surrounded by a zone of yellow discoloration; lesions coalesce and give plant a burned appearance; leaves that die remain attached to plant; circular, sunken, red-brown lesion may be present on pods; pod lesions may ooze during humid conditions. Disease can be introduced by contaminates seed; bacteria overwinters in crop debris; disease emergence favored by warm temperatures; spread is greatest during humid, wet weather. Bacterial brown spot, Pseudomonas syringae, a bacterium which causes small, dark brown necrotic spots on leaves which may be surrounded by a zone of yellow tissue; water soaked spots on pods which turn brown and necrotic; pods may twist and distort in area of infection. Bacterium overwinters in crop residue; disease more severe when foliage is wet for extended periods. Root-knot nematode, Meloidogyne spp. Galls on roots which can be up to 3.3 cm (1.3 in) in diameter but are usually smaller; reduction in plant vigor; yellowing plants which wilt in hot weather. Broad beans are rich in tyramine, and thus should be avoided by those taking monoamine oxidase inhibitors. Raw broad beans also contain the alkaloids vicine and convicine which can induce hemolytic anemia in patients with the hereditary condition glucose-6-phosphate dehydrogenase deficiency. Glucose-6-phosphate dehydrogenase (G6PD) is a cytoplasmic enzyme that is distributed in all cells. G6PD catalyzes the first step in the hexose monophosphate pathway, and it produces NADPH, which is required for reactions of various biosynthetic pathways as well as for the stability of catalase and the preservation and regeneration of the reduced form of glutathione (GSH). Because catalase and glutathione (via glutathione peroxidase) are essential for the detoxification of hydrogen peroxide, the defense of cells against this compound depends ultimately and heavily on G6PD. This is especially true in red cells, which are exquisitely sensitive to oxidative damage and in which other NADPH-producing enzymes are lacking. G6PD deficiency is the most common known enzymopathy; it is estimated to affect 400 million people worldwide. The highest prevalence rates (with gene frequencies in the range of 5 to 25 percent) are found in tropical Africa, in the Middle East, in tropical and subtropical Asia, in some areas of the Mediterranean, and in Papua New Guinea. The most common clinical manifestations are neonatal jaundice and acute hemolytic anemia. Hemolytic anemia occurs when red blood cells are destroyed faster than the body can replace them. In some cases, the neonatal jaundice is severe enough to cause death or permanent neurologic damage. The acute hemolytic anemia can be triggered by a number of drugs, by infections, or by the ingestion of fava beans. These manifestations may be life threatening, especially favism in children. The detailed mechanism of hemolysis is not fully known, but it results undoubtedly from the inability of G6PD-deficient red cells to withstand the oxidative damage produced, directly or indirectly, by the triggering agents mentioned above. Red cell destruction in these acute hemolytic events is largely intravascular and therefore is associated with hemoglobinuria. Fortunately, apart from these episodes of hemolytic anemia, most G6PD-deficient individuals are entirely asymptomatic. However, a rare subset of G6PD-deficient patients has, instead, a chronic hemolytic disorder, which may be severe. The remarkable geographic correlation between the prevalence of G6PD deficiency and the past and present endemicity of Plasmodium falciparum malaria strongly suggests that the former confers resistance against the latter. The high prevalence in malaria-endemic areas of G6PD mutants that have arisen independently corroborates this notion; indeed, it constitutes an example of convergent evolution through balanced polymorphism. Clinical data further support this notion, although it is not certain whether malaria resistance is a feature of heterozygous females only, or also of hemizygous males. In vitro culture studies have shown that the growth of malaria parasites is impaired in G6PD-deficient red cells, and that G6PD-deficient parasitized red cells are phagocytosed by macrophages more effectively than G6PD normal parasitized red cells. An estimated 400 million people have glucose-6-phosphate dehydrogenase deficiency. This potentially fatal condition is called favism after the fava bean. Areas of origin of the bean correspond to malarial areas. Some epidemiological and in vitro studies suggest the hemolysis resulting from favism acts as protection from malaria, because certain species of malarial protozoa, such as Plasmodium falciparum, are very sensitive to oxidative damage due to deficiency of the glucose-6-phosphate dehydrogenase enzyme, which would otherwise protect from oxidative damage via production of glutathione reductase. In the early twentieth century seedlings of the fava bean were used as an initial source of L-DOPA, a chemical used to increase dopamine concentrations in the treatment of Parkinson's disease and dopamine-responsive dystonia. Broad beans were a major food of old Mediterranean civilizations, particularly for the Romans and Ancient Greeks. Preparing broad beans involves first removing the beans from their pods. In some cuisines, particularly in France and the United States, the beans' outer skin is removed through blanching. In most other parts of the world, the beans' skin is not removed. The beans can be fried, causing the skin to split open, and then salted and/or spiced to produce a savory, crunchy snack. These are popular in China, Malaysia, Colombia, Peru (habas saladas), Guatemala (habas), Mexico (habas con chile), Gilan (North of Iran) and Thailand (where their name (ถั่วปากอ้า) means "open-mouth nut"). In Croatia, lamb with peas stew, Janjetina s bižima, (often with fava beans or artichokes) is a traditional Dalmatian dish. Becoming somewhat rare in restaurants, Kozlić s bižima, is a traditional dish made with goat kid meat cooked in a sauce with peas (biži), sometimes also with fava beans and potatoes. In Greece the word fáva (φάβα) does not refer to broad beans, but to the yellow split pea and also to the legume Lathyrus sativus. Broad beans are known instead as koukiá (Greek: κουκιά), and are eaten in a stew combined with artichokes, while they are still fresh in their pods. Dried broad beans are eaten boiled, sometimes combined with garlic sauce (skordalia). In Crete, fresh broad beans are shelled and eaten as a companion to tsikoudia, the local alcoholic drink. Favism is quite common in Greece because of malaria endemicity in previous centuries, and people afflicted by it do not eat broad beans. In Rome, Italy, fava beans are either cooked with guanciale or with globe artichokes, as side dish together with lamb or kid, or raw with Pecorino romano. Fave e Pecorino is the traditional dish for 1 May picnic. In Sicily, fava beans are the primary ingredient of Maccu soup . In Apulia, broad bean purée with wild chicory is typical dish. The Maltese Kusksu is a vegetable soup primarily containing fava beans and pasta beads. They are also used in a popular appetizer called bigilla where they are served as a pureé mixed with olive oil, lemon juice, garlic, parsley and mint. It is served with bread or crackers and is the Maltese answer to hummus. In Sweden broad beans (Swedish: bondbönor, literally: peasant beans), were for a very long time a popular food to add to other foods as a side filler to reduce the sensation of hunger by eating small amounts. This went on up until the mid-1940s, a time of rapid urbanization since when it has almost disappeared from Swedish plates. Broad beans (Spanish: habas) are widely cultivated in Spain and used as the main pulse in a stew (Favetes, habas estofadas, michirones) or as an addition to other dishes (menestra, paella). In certain regions they can be eaten while unripe or fried and packaged as a snack. In Egyptian cuisine fava beans (Arabic: فول‎‎ fūl pronounced [fuːl]) are a staple food. The fava beans may used fresh or dried and rehydrated as the primary ingredient in falafel. A popular dish, known as ful medames, is traditionally eaten with bread and is considered the Egyptian national dish. In Sudan fava beans ful medames form a main dish for lunch time (fatoor). In Ethiopia, broad beans (Amharic: baqella) may be used instead of peas to prepare shiro wot a traditional pea stew. During the fasting period in the Ethiopian Orthodox Church tradition, two uncooked spicy vegetable dishes are made using broad beans. The first is Hilibet, a thin, white paste of broad bean flour mixed with pieces of onion, green pepper, garlic, and other spices. The second is siljo, a fermented, sour, spicy thin yellow paste of broad bean flour. Both are served with other stews and injera (a pancake-like bread) during lunch and dinner. The main differences between Ethiopian and other ful medames is that the beans are fully mashed, flavoured with berbere, and served with big rolls of white bread (not pita or injera). Baqella nifro (boiled broad beans) are eaten as a snack during some holidays and during a time of mourning. On the Thursday before Good Friday, in the Ethiopian Orthodox Church tradition tselote hamus (the Prayer of Thursday), people eat a different kind of nifro called gulban. Gulban is made of peeled, half beans collected and well cooked with other grains such as wheat, peas and chickpeas. This is done to mourn the crucifixion of Jesus Christ. In Morocco, fava beans are made into bessara, a dip sold as a street food. Fava beans (Colombia: Haba(s)) are a common food in most regions of Colombia, mostly in Bogota and Boyacá. Barley and fava bean soup is a traditional Colombian soup consisting of carrots, peas, potatoes, barley and fava beans. In Mexico, fava beans are often eaten in a soup called sopa de habas, meaning "fava soup." 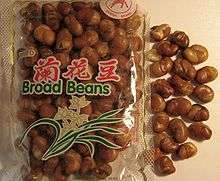 They are also eaten fried, salted, and dried as a snack, either by themselves or in combination with other salted, dried beans and nuts. In the State of Hidalgo, in north central Mexico, they are cooked with hierbabuena, Apple mint, to produce the region's caldo de habas, fava bean soup. Fava beans (Peru: Haba(s)) are one of the essential ingredients of the famous "Pachamanca" in the Andes of Peru and are also an additive for "Panetela", a homemade rehydration remedy in cases of diarrhea and cholera treatment. In Quebec, Canada, they are known as gourganes, and are eaten in a soup. In India, the northeastern state, Manipur, locally call it as "Hawai-Amubi" and is famous for its role as ingredient in Eromba, Kangsoi. In Nepal, fava beans are called Sukeko Bakulla Simi. 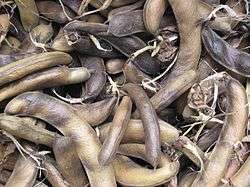 The young pods are eaten as a green vegetable, generally stir-fried with garlic. When dried, fava beans are eaten roasted, or mixed with other legumes and called qwati. The mixture, soaked and germinated, is cooked as soup and consumed with rice or beaten rice on day of Raksha Bandhan. The dry and stir-fried version of qwati is called biraula. The qwati soup is believed to reinvigorate the body affected by monsoon paddy season. In the Sichuan cuisine of China, broad beans, also known as Sichuan beans (川豆 chuāndòu) are combined with soybeans and chili peppers to produce a spicy fermented bean paste called doubanjiang. Broad beans, or "Baghalee" (Persian: باقالی) are primarily cultivated in the central and north parts of Iran around the city of Kashan. They have a very short season, roughly two weeks in the middle of spring. Fresh beans in season are cooked in brine with vinegar and Heracleum persicum to taste. The dried beans can be cooked with rice, which in north of Iran (Gilan) is called baghalee polo (Persian: باقالی پلو) which means "rice with broad beans". In Iran dried broad beans are cooked, served with Golpar-origan and salt and sold on streets in the winter. The Pythagorean code prohibited the consumption or even touching of any sort of bean. ↑ "Vicia faba (Broad bean)". Biological Records Centre and Botanical Society of Britain and Ireland. 1 2 Swenson, Allan A. (Dec 13, 2013). Foods Jesus Ate and How to Grow Them. Skyhorse Publishing, Inc. p. 240. ISBN 9781626366886. Retrieved 14 January 2016. 1 2 3 4 "Fava Bean" (PDF). ARC Centre of Excellence for Integrated Legume Research. Retrieved 8 January 2016. ↑ "Core Historical Literature of Agriculture". Chla.library.cornell.edu. Retrieved 2013-04-30. ↑ "Daughter of the Soil". Daughter of the Soil. Retrieved 2013-04-30. ↑ "Atlas of Genetics and Cytogenetics in Oncology and Haematology". Retrieved 14 January 2016. ↑ North Carolina Agricultural Experiment Station (1897), Annual Report of the North Carolina Agricultural Experiment Station, 19, Ashe & Gatling, state printers and binders, presses of Edwards, Broughton & Company, p. 347. ↑ Merriam-Webster, Merriam-Webster's Collegiate Dictionary, Merriam-Webster. 1 2 "Fava-the Magic Bean". Scientific American. SA. Retrieved 8 January 2016. 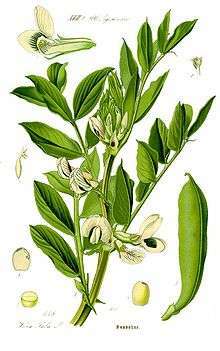 1 2 "FAVA BEAN (Vicia faba L.)" (PDF). Oregon State Univ. Extension. Retrieved 8 January 2016. 1 2 3 4 5 6 7 8 9 10 11 12 13 14 15 16 "Broad bean, dry". Plant Village. Retrieved 12 January 2016. ↑ "Beans, Fava". Oregon Vegetables. OSU Department of Horticulture. Retrieved 9 January 2016. ↑ Mohamed Hemida Abd-Alla (20 January 2014). "Synergistic interaction of Rhizobium leguminosarum bv. viciae and arbuscular mycorrhizal fungi as a plant growth promoting biofertilizers for faba bean (Vicia faba L.) in alkaline soil". Microbiological Research. 169 (1): 49–58. doi:10.1016/j.micres.2013.07.007. Retrieved 9 January 2016. ↑ "Broad beans". Royal Hort. Soc. Retrieved 10 January 2016. 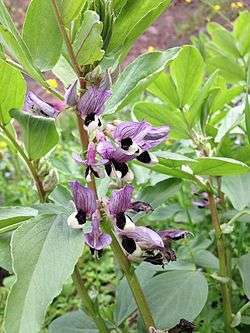 ↑ "Top 10 Broad Bean Varieties". Vegetable Gardens. Retrieved 10 January 2016. ↑ "Broad bean rust". Royal Horticulture Society. Retrieved 10 January 2016. ↑ "Broad bean chocolate spot". Royal Hort. Soc. Retrieved 10 January 2016. ↑ Daniel K. Hall-Flavin, M.D. "MAOIs and diet: Is it necessary to restrict tyramine?". Mayo Clinic. 1 2 "Glucose-6-phosphate dehydrogenase deficiency". Genetics Home Reference. 11 January 2016. Retrieved 16 January 2016. ↑ Kathrynne Holden. "Fava Beans, Levodopa, and Parkinson's Disease". ↑ Russ Parsons. "The Long History of the Mysterious Fava Bean". ↑ Nelson, L. David; Cox, M. Michael. 2005. "Chapter 14- Glycolysis, Gluconeogenesis, and the Pentose Phosphate Pathway" in Principles of Biochemistry. Freeman, New York. p. 551. ↑ Hornykiewicz, Oleh (16 November 2010). "A brief history of levodopa". Journal of Neurology. 257 (S2): 249–252. doi:10.1007/s00415-010-5741-y. PMID 21080185. 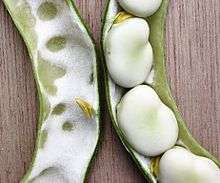 ↑ "How To Pick, Clean and Prepare Fava Beans". Retrieved 9 January 2016. ↑ Prasertong, Anjali. "Time-Saving, Mind-Blowing Tip: You Don't Have to Peel Fava Beans". The Kitchn. Retrieved 1 May 2016. 1 2 "Ful — The Egyptian National Dish". Retrieved 8 January 2016. ↑ "Taste of Croatia". Retrieved 10 February 2016. ↑ Helstosky, Carol (2009). Food Culture in the Mediterranean. Greenwood Publishing Group. p. 7. ISBN 0313346267. ↑ Collar "Recipes from Luxembourg", Luxembourg Tourist Office, London. Retrieved 3 December 2011. ↑ "Kusksu: A traditional Maltese fava bean soup for Lent". Malta Bulb. Retrieved 28 February 2016. ↑ "Bigilla – Maltese Fava Bean Dip". Retrieved 28 February 2016. ↑ "Broad Beans: twice as good as they should be". Swedish food — blogs.sweden.se. Retrieved 11 January 2016. ↑ "Ethiopian Ful Medames – Fava Beans with Berbere and Tasty Garnishes". Herbivoracious. Retrieved 8 January 2016. ↑ "Morocco's best street food". cnn.com. ↑ "Barley and Fava Bean Soup". The Latin Kitchen. Retrieved 10 February 2016. ↑ "The Cuisine of Hidalgo: Spanning Climates and Cultures". Mexconnect. Retrieved 10 January 2016. ↑ Pathak, Jyoti. "Dried Beans, Lentils, and Peas – (Daal Haru)". Taste of Nepal. Retrieved 28 February 2016. ↑ Holliday, Taylor. "Sourcing Pixian Douban Jiang (Chili Bean Paste)". The Mala Project. Retrieved 28 February 2016. ↑ "Broadbeans (fava beans), mature seeds, cooked, boiled, without salt". Nutrition Data. Retrieved 10 January 2016. ↑ "Fava beans nutrition facts". Nutrition and you. Retrieved 10 January 2016. ↑ Hazelton, Nika (Feb 21, 2014). Nika Hazelton's Way with Vegetables: The Unabridged Vegetable Cookbook. Rowman & Littlefield. p. 384. ISBN 9781590772713. Retrieved 14 January 2016.